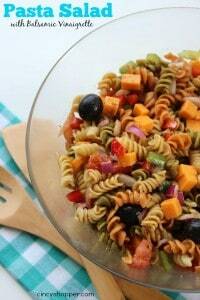 I am loving this new Pasta Salad with Balsamic Vinaigrette Recipe that I created this afternoon. It’s very simple but full of great balsamic flavor. Lately I have been buying myself pasta salad at Remke. I am almost thinking I have a sick addiction ha ha. Summer always has me craving different salads. We have quite a few graduation parties to attend these next few weeks that I have offered to bring a dish to pass. I offered up a salad for each one. I will be honest, I am the only one in my household who is a fan of pasta salad. So I usually just grab a small dish from the deli or just throw a Betty Crocker Suddenly Salad together. This past week I was realizing how much those trips to the deli counter for pasta salad have been costing. Yimes at $4.99 per pound I decided I need to start making my own. 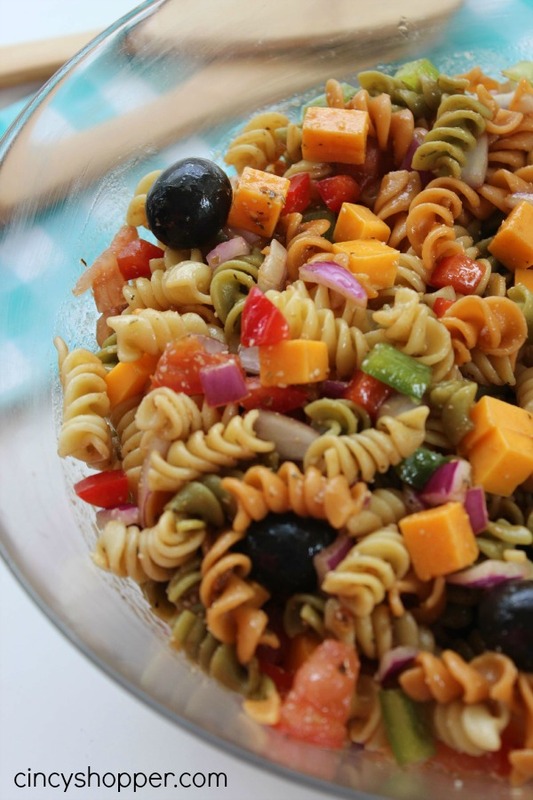 Plus, I had a few of you who mentioned pasta salad as some of your favorite summer salads so I know this Pasta Salad Recipe is going to work great for my dish to pass at our graduation parties. 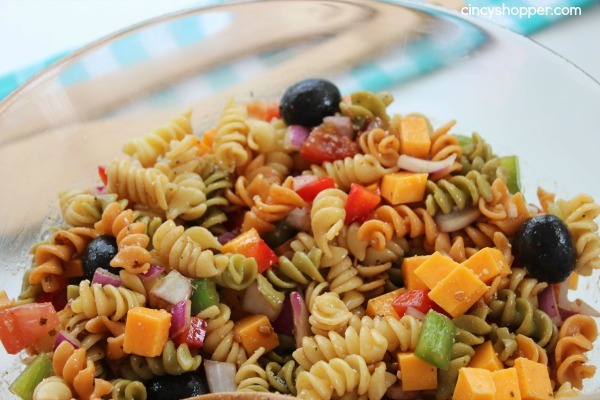 Making Pasta Salad at home is so simple. I tossed in a few of my favorite veggies. 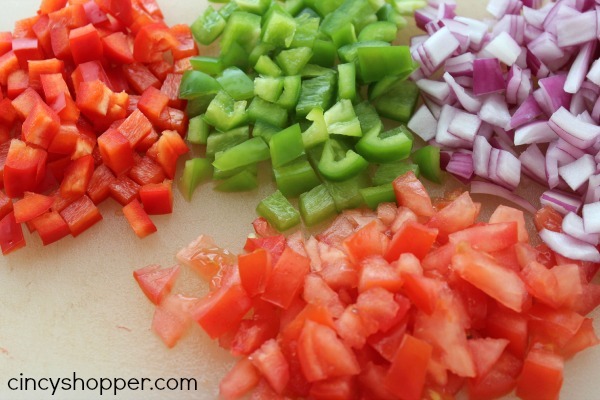 I really like onions, tomatoes, peppers and I HAVE to have the cheese. The addition of a small amount of parm and then some sharp cheddar was perfect. The balsamic dressing that I whipped up was perfect. I normally will just use a bottle of store bought dressing but the addition of the balsamic vinegar flavoring was perfect. This looks really good. Maybe when summer finally arrives here, usually late June here in Calgary. I will try it, with gluten free spirals. The salad dressing especially looks good. 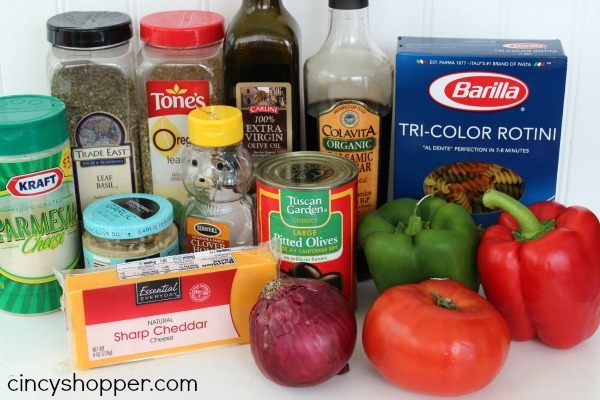 Once I try your recipe, I might try it also with a can?, 1/2 can black beans with mozzarella cheese. Wow, the possibilities. Thanks so much for your recipe.